According to APSAD R1, sprinkler-type automatic fire protection must be restored to compliance every thirty years. The purpose of this phase is to define the protection required by the current standard in order to determine incompatible elements of protection. At the end of this phase, we write a feasibility study report mainly comprising the result of the initial audit (summary charts listing the discrepancies between the existing systems and the new reference standard), the risk zoning plan, the control valve zoning plan and a site coherence check. The risk zones are rubber-stamped and classified at a meeting with the insurer. The investigation is conducted on the parts of the system that can potentially be reused. The purpose of this phase is to draw up an inventory identifying the existing parts that are fit to be kept and the alterations to be made. The detailed investigation consists in ascertaining that the existing systems are capable of outputting the flow rate determined for the new worst-case scenario, on the basis of drawings and hydraulic calculations. It also involves measuring the state of corrosion and sludge formation in the sprinkler piping from the control valve to the sprinkler heads and ensuring that these heads work properly. These specifications are written following approval of the summary report by the client and/or insurer. They include the work to be planned on the networks and systems, the pump rooms and sundry work, such as civil works, underground piping, electricity, alarms, etc. The role of a sprinkler system is to detect a fire and extinguish it as soon as it starts or, at least, to contain it so that it can be extinguished by the protected site’s resources or by the fire service. A sprinkler system takes the form of a piping network that drenches an outbreak of fire with pressurised water. The branch lines hold the sprinklers that open under the effect of temperature and activate drenching. To be effective and reliable, a sprinkler protection system must be designed and constructed in accordance with very precise rules based on legislation and/or sprinkler standards. From design to acceptance, CYRUS INDUSTRIE provides assistance with your new installation projects and audits of existing systems (sprinkler thirty-year upgrades, for example). Work to restore sprinkler installations to compliance depends on the current state of your system and the selected benchmark. Partly inspired by the APSAD thirty-year compliance methodology, the purpose of upgrading sprinkler installations is to bring an existing system up to today’s standards. The principle can be applied to EN 12845 or NFPA-standard installations. Following a thorough audit, it is also conceivable to transfer an installation from one standard to another. The purpose of this service is to determine the technical scope and budget of your sprinkler project, in line with the company’s master plan. It establishes the dimensions of the fire protection sprinkler systems and defines the water source(s) and pump room(s). All work and services peripheral to the sprinkler system can then be listed and a budget estimate calculated for the entire project. 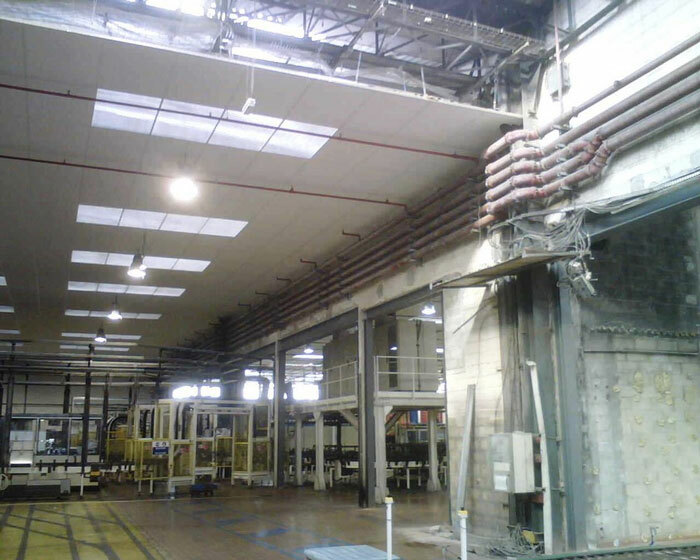 We conduct site surveys as part of this assignment. These surveys provide a basis for the risk analysis and regulatory analysis. We then define the sprinkler protection system on the basis of standards published by the insurer (NFPA, APSAD, FM Global, etc.) and any recommendations. We prepare the zoning plan with layout of the main components (pump room, valve room, etc.). We calculate the water requirements and check availability at the site. We can then pre-define the main fire protection equipment (pumps, water storage tank and sprinkler valves) and the principle of the alarm relaying system. We also define the list of related studies and work to be planned (civil works, special foundations, underground piping, secondary containment, structural steelwork reinforcement, electricity, alarm relaying, etc.) 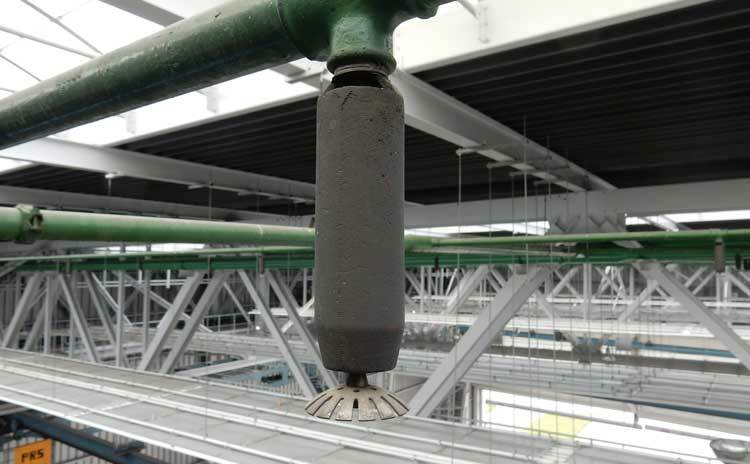 with the principle of fire water containment and/or recovery which is an essential component in this type of sprinkler design project. We can then determine the budget for the project to within 0/+30%. Finally, we write a summary report and prepare a PowerPoint presentation of the project. This feasibility study may serve as a base document for the project itself (insurer’s approval, additional studies, preparation of the tender specifications, etc. ).